The Museum of Broken Memories. The game starts in the Main Hall where you will find Save-Load-Quit. You will know the save is good if you can’t go through the picture of each room. In the Main Hall, find also a map of the museum. When you click on it, the glass will break. You then can click on any room. The game is played using the left mouse only. No inventory in the game. There are many texts in this game. A really thought provoking experience. In five of the seven rooms, there is a picture in which you will go in to continue your game. If you want to get out of the picture, press the “escape” key to be back at your desktop. Note that the game will not be save. Click on room #3 on the map. When you get in that room, see a bench. The door in front of you gets you back to the Main Hall. On the left of the door, see a picture with some writing on it. Turn left to see three stands and two frames with text on the wall. Read them. Turn left again to see another stand and a picture: “The room inside my head”. Click on the picture to see a text. You will then see multiple texts. Use the hammer found on the table but it won’t break the window. The shovel will not do it either. In front of the shovel, find a pile of logs, but no key. On the most right, a closet: no key. When you click on any object in the closet, you find yourself at the other side of the room where you see an hourglass, a door and some bottles under the table. If you click on any of the three objects, you get back to The Door Room and you can’t get back in the picture. Continue to visit The Door Room: turn left again to see another stand with an hourglass and two other texts on the wall. Read all texts in the room. Go back to the Main Hall with the door. In this room, find also some stands and texts. Find a picture: “in the ruins”: click on it to get a text. Click again to be in front of a bench, a house and a person. Go left: see the “yes we’re OPEN “sign. Left again to some road construction and a man: nothing for now. Back to the bench and go right: see a tank. Go right again and go through the opening to a man: click on him to get a text to read. Use the arrow at bottom of the screen to come back to the opening and go right again to a building and a wheelbarrow. Come back to the tank to get a text about the house. If you go back to the man in the opening, he will talk about the house. Now, go back to the man at the construction site to get another text to read. Go right to get another text on the OPEN sign. Back to the bench and click on the person: read the text. Go right and click on the photo on the ground - another text to read. Right again to the wheelbarrow: in front of it, click on the teddy bear to get a text. Go back to the man at the construction site to go back to the Room of Ruins. You arrive in front of a picture and a stand. We will come back to the picture. Go around the room to look and read. This is some kind of maze because you go in and out the rooms many times. Click on the picture to be in a black and white room with a sofa: have a look at everything starting with the picture on the right: “Image. I do not understand. Can you hear the waves”? Open the door: a room with a phone. Answer it. Find two doors in the room: the first one is locked. The second one will open to a room with a round carpet. Look at everything. Open the white door to a storage room: find a key in the box on top of the shelves. Leave using the arrow down the screen. Go to the room with the phone using the down arrow. Open the first door: a room with a hanged man. At the back of this room: a black door. Come back to the hanged man with the down arrow and read what he says. Click again to be back in the room with the round carpet: go through the door to be in the hanged man room: “the water is rising” he says. Pass the door to be in the phone room: the first door is locked again. The second door: can’t go there: water behind this door. Come back 3xs to the room with a picture: go to the door on the left: storage room: get a key in the box. Get out with the down arrow. Forward 3xs back to the room with the phone: open the first door. It is the room with the picture on the floor: can’t go through the door at the end. Come back to the phone room with the down arrow. Answer the phone and get a picture. Click to be in the carpet room. Forward 3x to the phone room and the first door: room with picture on the floor: click on the door: an image: click on it to be back in the phone room that is tilted. Open the second door and go to the door on the left: storage room: key in the box. Down arrow 2xs to the phone room and open the first door to be in the room with a carpet?????? In the glass cupboard, take a key. Down arrow to the phone room and open the second door and go through the door on the right to the hanged man room and pass the door at the end: the room in the picture of room #3: take the key on the table on the left. 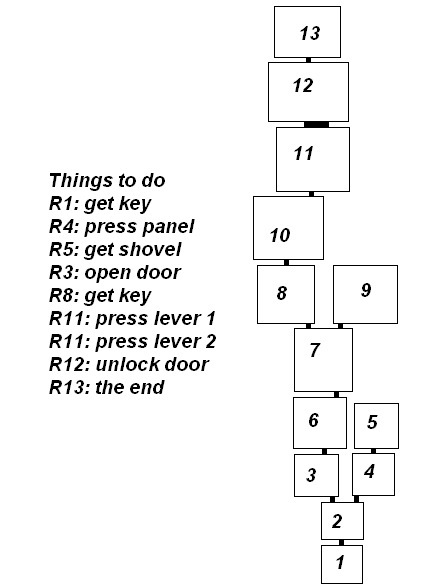 Down 2xs to the phone room: use the first door to be in the carpet room: open the door to be in room with picture on floor: go through the door. The next room is tilted more: open the door: phone room: click on the picture at the end: “...only you can pass through them” Open the first door: storage room: key in the box under the light. Go out of this room with down arrow. Open the second door: hanged man room: use the door at the end to be in a room with three doors: take the middle door to see you can’t go through the other door. Take the door at the end of this room and then the door in the middle and the other door: click to be back in the Fever Room. Go around the room to see and read what is in it. Go to the “Welcome to” picture and click on it. Click on the arrow to have a Map of the town. The mansion: see the picture and some notes. Shop: yes were open: click there: some text. Click on the word “talk” at bottom right and on the square between the windows. Old friend’s house: get in and go around. Press on Town Hall memo. Warehouse: click on the man. Graveyard: click on man to see a text: “How can you get out?” Click on those writings and be back in the Room of Notes. Go around the room as you did for the other rooms and keep the black canvas for last. Enter the black canvas. You are in a maze, but you cannot see. You are in room #1, according to the map. The entire screen is room #1. Move your cursor around the black screen to find the text about a door. You now need to find a key, which is also in that room. When the door is open, you are in room #2. Take your cursor at the bottom of the screen to see a backward arrow (down arrow) that will bring you back to room #1 if you want. Then, to move forward to other rooms, find a forward arrow and search what must be done in those rooms according to the description on the map. And finally, you are back in the Dark Room where you entered the black canvas. After saving the game in the Main Hall, click on room #2 on the plan to get a text. Click on the wall to see several pictures and texts. Click to a last text.